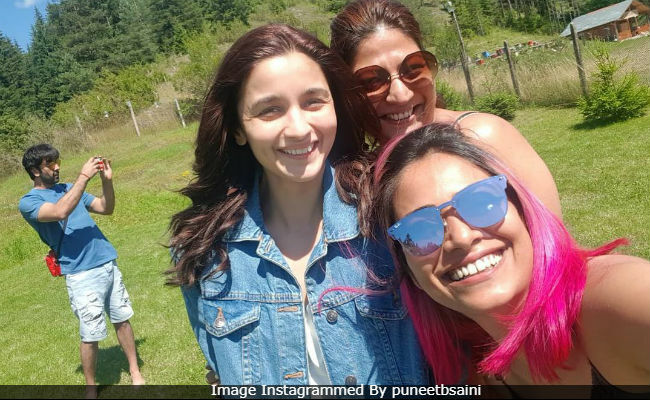 Ranbir Kapoor, filming Brahmastra in Bulgaria, made a brief appearance on rumoured girlfriend Alia Bhatt's Instagram profile. Oh, did you miss it? Don't worry, we have it curated here for you. 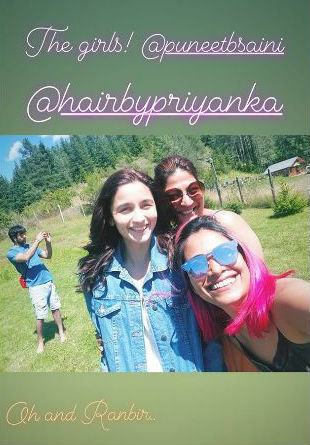 On her Instagram stories, Alia, who is also in Bulgaria for Brahmastra, shared a picture with her make-up artist Puneet B Saini, hairstylist Priyanka Borkar and also Ranbir Kapoor. But, wait. Where exactly is Ranbir in the frame? Right at the back, folks! He is busy capturing the beauty of Bulgaria on his phone while Alia and others pose for the photo. "The girls... oh, and Ranbir," Alia captioned the post. The same photo has also been shared by Puneet B Saini, who wrote, "Babies for life." (Were you able to spot Ranbir?). Alia Bhatt and Ranbir Kapoor's dating rumours featured in headlines after the duo appeared before the cameras together at Sonam Kapoor and Anand Ahuja's wedding reception. Later, the only thing Internet wanted to know was if Alia and Ranbir were dating. When mid-day asked the same question to Ranbir, he said, "Main iss sawal ka jawab dene ke liye raazi nahi hoon!" (Raazi is Alia's last-released film). But he's not single, BTW. "I'm not single. I'll never be single," he told mid-day. On the work front, Ranbir Kapoor recently shattered some major box office records with Sanju, which has already earned over Rs 300 crore while Alia's Raazi was also a blockbuster film. Brahmastra, a trilogy, releases next year. The Ayan Mukerji-directed film also stars Amitabh Bachchan, Nagarjuna and Mouni Roy.